product into clinical trial is a double-armed oncolytic adenovirus (LOAd703; delolimogene mupadenorepvec) that is tested in patients with pancreatic-, biliary-, colorectal-, and ovarian cancer (NCT02705196, NCT03225989). LOAd703 is an adenovirus serotype 5/35 armed with TMZ-CD40L and 4-1BBL. TMZ-CD40L and 4-1BBL are two potent stimulators of anti-tumor immunity by their capacity to activate dendritic cells and M1 macrophages to produce IL12, TNFa, IFNg and IL21, as well as to expand both memory T cells and NK cells. Further, TMZ-CD40L activates tumor stroma to participate in recruiting and activating anti-tumor immunity. Eriksson et al Clin Cancer Res 2017. Our viruses are oncolytic in cancer cells without capacity to replicate in normal cells. However, TMZ-CD40L and 4-1BBL are expressed by all cell types in the tumor stroma which we believe is essential to prolong duration and strength of inflammation. Our viruses are currently delivered by intratumoral injection. 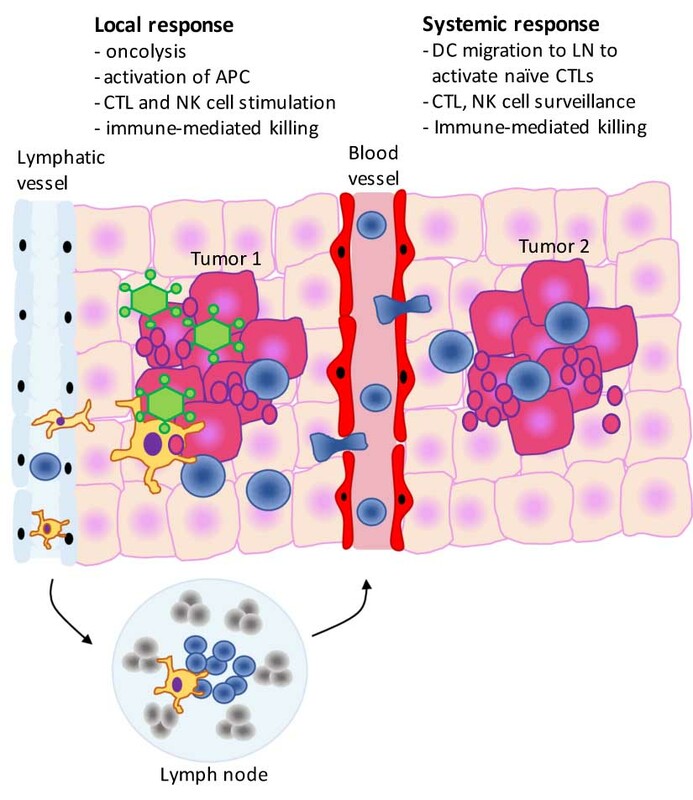 Our hypothesis is that a local immune activation will become a systemic response due to the activation of dendritic cells in the tumor microenvironment that migrates to lymph nodes to activate T cell responses. T cells will seek and destroy tumor cells at different locations in the body. Our pipeline consists on a variety of LOAd family viruses. The idea behind the design and selection of transgenes is based on the biology of tumors and cross talk with the stroma.